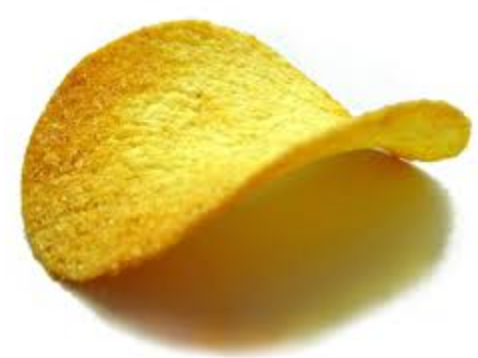 Pringles are made by turning potatoes (and some wheat) into powder, and then molding them back into a shape of a potato that was sliced up and fried. 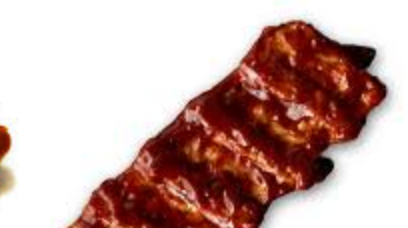 The McRib consists of homogeneous meat that's been shaped to resemble a more natural configuration of meat. Harvest Snaps are peas that have been turned to powder and then pressed back into the shape of a fresh pea pod. Bonus Question: All the examples I can think of are industrially processed food. Are there any traditional or home recipes that use a similar technique? This is most often used to describe meat products such as "reformed ham" or "reformed scampi". You can occasionally see onion rings made with chopped onion described as reformed, e.g. here. Pringles could be described as "reformed potato snacks" for example. Pringles are less than half potato though, so that may not be entirely accurate. As for doing this at home, it's common to bake a potato, scoop the potato from the skin, mash it up with some seasonings and then put it back in the skin, thereby reforming the potato. The relatively new term of Molecular Gastronomy, I think would apply, though my saying so I am sure would cause practitioners to cringe. MG is the aspect of food science which studies the physical and chemical transforming of food to study effects on flavor and form. The term is normally applied to the mad scientists of the kitchen, like Hester Blumenthal, though he says that he hates the term because he think it makes such techniques seem more complicated than they are, and I agree to him to the point that I think it applies to the more commercial forms that you asked about. The term is generally applied to things like spherification. But look at that as an example, Blumenthal will do things like take peas, puree them and create a concentration, and then spherify it back into something that looks like a pea again but with stronger flavor. Is this different that taking a potato, grinding, drying, enhancing the color, and reforming it into a uniform packaged shape? To me, same practice, just at an industrial and different quality level. The term encompassed the entire field of studying subtle effects in temperature, texture, shape and form, and was coined to apply more to high end, showmanship presentations I think, but really is applicable to the whole field of physically or chemical re-engineering the look and feel of food item. "Extruded" is used to describe the end product in some cases. This is the process of forcing soft material through a nozzle to give it shape (whether that's hot aluminium or potato). At home, piping is closest. Piping mashed potato is a bit fancy for me but could certainly be done. Making sausages is very similar, though of course they're forced into a casing. If you start with a steak, mince it and form it into a burger you're doing something quite similar, but extrude doesn't apply there. Not the answer you're looking for? Browse other questions tagged food-processing chips snacks or ask your own question.